We’ve been using a cash envelope system for years now (not always consistently, to be honest…but recently this has become a way of life). Using cash envelopes is SO helpful, and such a game-changer, that it inspired the Spend Well Budgeting System (also, my old system was ugly, and I wanted something cuter…ha). Today I want to show you how to use a cash envelope system. I love my Spend Well, and I’ll be showing you how I use that…but you can use *any* old envelopes to create your own! The cash envelope system is a way to save money and organize your cash based on your budget. How do I get started with cash envelopes? 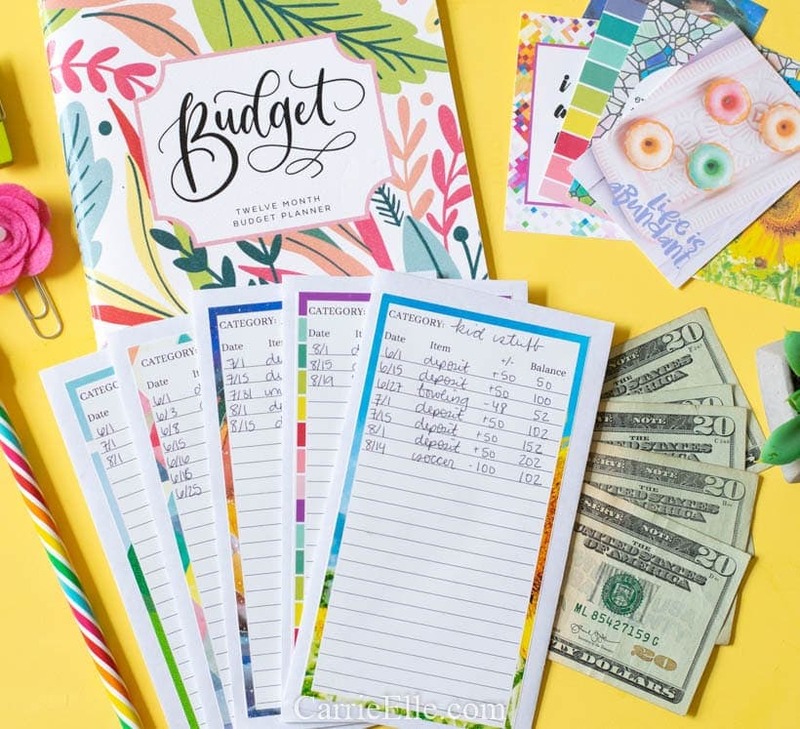 So the first thing you’ll need to do is create a budget (this post isn’t going to be about creating a budget, but I’ll give you the Readers Digest version!). This doesn’t mean we’re spending all our money away, though. It only means that every penny has a place. Every dollar is designated to an expense that we’ve accounted for in our budget (this includes savings, food, upcoming expenses, etc.). Because cash is harder to spend (for me!) and we tend to have an emotional connection to cash, we pay cash for everything we can. This makes it a little harder to part with our money (which is important if you’re a natural spender, like me! ), AND it makes it easier to keep up with our money (since we are literally taking it from an envelope and handing it over to someone every time we buy something). How do I know what categories to use cash envelopes for? The first thing you need to do, before you budget and before you start pulling cash out of the bank, is determine what your spending categories are going to be. Some of mine are food, entertainment, kids, clothes, car repairs, mortgage, insurance, and personal “allowance” money for myself and my husband. I also include things we’re saving for, like Christmas, vacations, new furniture, etc. Once you’ve figured out your spending categories, decide which of those you can pay for with cash. For example…we can pay cash for food, entertainment, to save for vacation and Christmas, etc. We have about eighteen cash categories! Every month, we sit down and do our budget (if you sign up for the 60 Day Challenge, you’ll get a budgeting template…I also have one available here, or you can google it and find one that suits your family’s needs…that’s the most important thing!). You don’t need a special template, though…you just need to know exactly how much you’re making, how much you’re spending, and how much you need to be saving. Our budget is pretty much the same each month, but we do have things that change…we touch our budgeting spreadsheet several times a month! Once you’ve figured out your monthly budget and decided on your cash categories, it’s time to put your envelope system together. We use the Spend Well, but all you need are a stack of envelopes big enough to fit dollar bills (DOLLA DOLLA BILLS, y’all). You’ll want one envelope for each cash category. How much cash do I need to get started with cash envelopes? Determine how much cash you need to fund your envelopes (we pay ourselves twice a month, so we work off that and make two trips to the bank each month to pull out cash). Every category that you can pay for with cash gets its own envelope. Once you have been to the bank and pulled out your cash, you’ll fund your envelopes. Every time you make a deposit into your envelopes, and every time you take something out, you’ll record it on the actual envelope. This lets you know exactly how much money you have at any given time. When you shop or need to pay for something, pull out the amount you need. We don’t take the whole envelope to the store…we just pull out enough cash to cover our groceries. Then, when we get back from the store. we record how much we spent and return the rest to the envelope (hold on to your receipts if you’re out an about all day, or you might forget how much you actually spent!). How do I use cash envelopes for online spending? If you find yourself making an online purchase for something you’ve budgeted cash for (for example, you budgeted cash to buy soccer equipment for the kids and ended up buying it on Amazon because who has time for lines), that’s totally okay. But you still need to account for it! Pull out the cash and store it in an extra envelope. Write down the transaction on the envelope so you know where it came from and how much you have. You can take this back to the bank if you need to cover your expense, or hold onto it and use it to fund the envelopes your next round. Example: We had $40 budgeted for gifts this month. I ended up buying something online and shipping it to the recipient. My total was $40. I wrote down than I spent $40 on a gift on the “Gifts” envelope, pulled out the cash, and stuck it in an extra envelope. On that envelope, I recorded the deposit just as I would any other deposit so that we know exactly how much is in there next time need to pull out cash. Side note: this is where that buffer in our budget comes in handy! Managing our cash in this way helps us to really keep our spending in check, AND it gives us a much more realistic picture of how much money we really have! If we want to eat out but that means we won’t have enough money for groceries the next day, we get creative (and go grocery shopping a day early or find something to eat at the house). Budgeting, especially if you’re new to it, can feel overwhelming and frustrating. But I promise you it’s worth it. A budget helps you take control of your finances. Cash envelopes can help you dial in your spending even more…while helping you to save, too! I feel overwhelmed – how can I get started budgeting? If you’re overwhelmed about budgeting, come join my 60 Day Challenge…you’ll get actionable steps that will help you piece together your finances and map out a plan for saving, paying things off, and better understanding your money. If you’d like to buy a Spend Well Budgeting System, you can buy one here (use code BUDGETANDTHEBLOG01 for 15% off). If you’d like to buy the Spend Well digital files, you can buy them here (use code BUDGETANDTHEBLOGDIG01 for 30% off). Join me on Facebook for more budgeting help, tons of free printables, and meal planning tips and tricks, too! Here are some other money-related posts you might like! I just received this envelope system from you, a few days ago. I’ve also been doing the envelope system since February of 2016. Your system works beautifully!!! THANK YOU! Can I ask how you deal with change? I’m Canadian so any change under $5 is in coin. It makes things bulky and heavy. suggestions? Oooh, that’s a tough one! When I have change, it’s always less than a dollar and I toss it in our vacation jar (then we cash out when we go somewhere and use it for spending money). I might not do that if everything under $5 was change, though. What about keeping a change purse on you, and then emptying it into the appropriate envelopes at the end of the day? This is awesome, do you ship internationally? I am in Ireland and would love to buy one! That’s awesome, Ashley! I would love something like that here – it sounds so useful! How do I go about purchasing one of the envelope category budget system? will they be restocked anytime soon? Will you be restocking your Spend Well Budgeting systems? I think I am interested!! Hi. When will you be restocking the Spendwell Budget system planners? I am looking into purchasing one of your precious spend well systems, and it’s sold out! Will they be back anytime soon? I’m trying to order the sunrise budget system and it won’t let me put the discount in 🙁 any tips ? Hi Cristin! I’ve fixed the issue and it will work now – sorry about that! Do you sell or ship to Ontario Canada? We do! <3 there should be a "Canada Shipping" option at checkout. Yes, my name is Kristen Smith.. I am on disable S/S AND SSI…. I am doing a little what you said. my envelopes, and name them..
lost your email.. help… try me on email again.. about disability that i had and ssi. i asked about name is kristen smith..
Hi Kristen! It sounds like you’re on the right track! I would definitely set aside an envelope for savings, too…an emergency fund envelope will make sure you have cash on hand for emergencies, and that can really help keep you from going into debt or having to use savings from your other envelopes. Hello, what do you do if you don’t spend all of the money in a particular envelope that month? 1. Keep the money in the envelope and add $100 the next month so you now have $160 (this is what I do – I just roll it over to next month). 2. Or, next month, just add $40. Then the $60 you saved could go into another envelope, or towards savings or an emergency fund.